"What Do We Know About the Magi?" "What Do We Know About the Magi?" The word “epiphany” comes from the Greek word, “epiphainen,” a verb that means "to shine upon," "to manifest," or “to make known.” Thus, the feast of the Epiphany celebrates the many ways that Christ has made Himself known to the world, mainly the three events that manifested His mission and divinity: the visit of the Magi (Matthew 2:1-12), the baptism of Jesus (Mark 1:9-11), and the miracle at Cana (John 2:1-11). According to Matthew (Matthew 2:1-12), the only one of the four Gospels to mention the Magi, they came "from the east" to worship the "king of the Jews," offering gifts of gold, frankincense, and myrrh to the Holy Child. Although the account does not mention the number of Magi, the three gifts has led to the widespread assumption that there were three men. Unfortunately, nothing is known with certainty about the identities of the Wise Men from the East. It is surmised that they were gifted astronomers and astrologers--probably Medes from the clan of Magus, from ancient Babylon (modern Iraq). Scripture tells us that the Magi made their presence known to King Herod before the visit and that they were warned in a dream to return to their own country by a different route to avoid Herod after they saw Jesus. Their identification as kings is probably linked to Psalms 72:11, "May all kings fall down before Him". 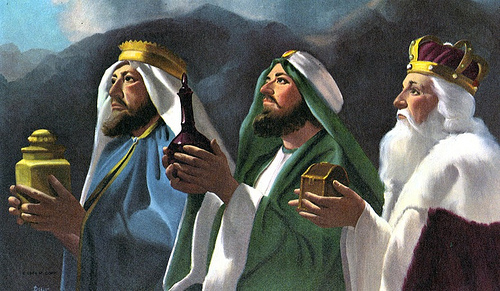 Although the New Testament does not give any names to the Magi, by the 8th Century they were identified as Balthasar, Gaspar, and Melchior, and were all regarded as saints. Tradition tells us that Balthasar is often represented as a king or a scholar from Babylonia; Melchior as a king or scholar from Persia, and Gaspar as a king or scholar from India. These names apparently derive from a Greek manuscript probably composed in Alexandria around 500 translated into Latin with the title Excerpta Latina Barbari. Another Greek document from the 8th century, translated into Latin with the title Collectanea et Flores, continues the tradition of three kings and, along with the above-cited names, gives additional details. The Bible specifies no interval between Jesus' birth and the magi's visit; however, the closeness of the traditional dates of December 25 and January 6 encourage the popular assumption that the visit took place the same winter as the birth, but later traditions varied, with the visit taken as occurring up to two winters later. This maximum interval explained Herod's command in Matthew 2:16-18 that the massacre of the innocents should include boys up to two years old. If you were to stroll around Prague or Frankfurt or Budapest or Kraków over the next few weeks, you might see curious graffiti scratched in chalk over some doorways: "20 G M B 16." The families dwelling behind those doors have celebrated the Epiphany door blessing. They have gathered before the feast-day meal, probably after Mass, and the head of the family has traced the sign of the cross on the piece of chalk. Standing on a ladder, the leader writes the numbers for the new year, and the letters C M B for Christus Mansionem Benedicat, Latin for "May Christ bless this house." The letters also point to the names that tradition has assigned to the mysterious magi, Caspar (an alternate name for Gaspar), Melchior, and Balthasar. The blessing speaks of journeys ended and journeys begun at the doorway, and prays that all journeys be as satisfying as was the magi's. It prays that the house beyond the door has the quality of love and peace that the magi marveled at when they at last arrived in Bethlehem. In some countries where the Soviet Union tried to impose a harsh atheism, the vigor of this household custom survived all efforts to erase Christian customs. In the years of struggle, the chalked blessings were a pervasive sign of defiance, and now in the light of new freedoms, they are a sign of the resilience of our tradition and the fulfillment of the magi's quest for meaning and peace.